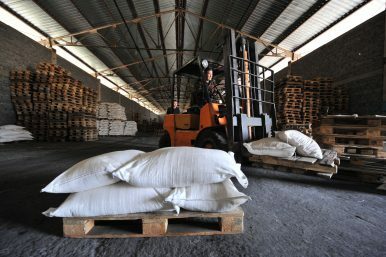 A warehouse in Bishkek, Kyrgyz Republic, near the ADB-supported Bishkek-Osh road. Kyrgyzstan is dependent on foreign aid, which also impacts its internal political rivalries. Among the Central Asian states, the Kyrgyz Republic has been one of the most dependent on foreign aid since gaining its independence from the Soviet Union in 1991. The country has continuously received more than $9 billion in foreign loans (72 percent of all aid) and grants (28 percent) for development in the last 25 years. As of 2017, Kyrgyzstan owes nearly $4 billion to global financial institutions such as the World Bank, Asian Development Bank, International Monetary Fund, European Bank for Reconstruction and Development, and others; and to foreign states like China (which accounts for close to 40 percent of the total debt), Japan, Germany, Turkey, and Russia. For some context, the Central Asian nation’s GDP in 2015 was recorded at $6.5 billion. Kyrgyzstan failed to reform the country’s governance after the overthrow of the second regime in 2010, which many insist was brought down in part due to years of corruption and bribery in the state institutions. Seven years after the uprising, corruption remains one of the biggest obstacles in the Kyrgyz Republic. According to the UNDP, the annual damage from corruption in the country is reaching some $700 million yet the Kyrgyz authorities consistently enjoy assistance on the bilateral or multilateral level in the form of foreign aid. In essence, foreign aid from abroad has helped the country sustain its weak economy for more than 20 years. Foreign development banks provided crucial funding to mitigate environmental concerns that are related to post-Soviet legacy uranium mines in Kyrgyzstan. However, foreign aid has also had an impact on the internal power balance within the country. Arguably, notorious factional politics have been a trademark of Kyrgyzstan for decades. Meanwhile, donors and foreign development organizations may inadvertently find themselves in the middle of an ongoing power struggle that is gripping the nation. The latest example of unintentional entanglement is attributed to the German KFW development bank’s projects in Kyrgyzstan four months ahead of the 2017 election. The Kyrgyz Republic is expected to vote for a new president on October 15. Despite warnings from the central election commission to the candidates, an unofficial nationwide campaigning was launched early last month. And it appears the incumbent president’s adviser, Ikramjan Ilmiyanov, attended the grand opening of the KFW-funded community water project in Leylek district of Batken province in May. This was interpreted among the public as a move to secure needed votes in the southern districts for President Almazbek Atambayev’s preferred candidate, current Prime Minister Sooronbai Jeenbekov. Previously, Ilmiyanov, who attended the project opening, was named manager of Jeenbekov’s election headquarters, according to local press. To be fair, this particular project with KFW financing was approved in the summer of 2016 and completed May 30, 2017. Therefore, it is highly unlikely Germany’s KFW was guilty of favoritism in the country’s messy factional politics. However, this episode raises questions regarding the foreign assistance policy, which stipulates organizational procedures to minimize or avoid entanglement in the internal political rivalries of the recipient state. …can increase the conflict over scarce governmental resources, it can shift the competitive balance across sectors of the economy, and it can change the very relationships the government has with its opposition and its citizens… Whereas the politics in aid allocation are consistent with the national interest of the donor at least, the politics in aid receipt are easily corruptive to the political equilibrium of the recipient country. Aid can disturb the balance, tipping the politics toward more conflict, more incumbency advantage, more strategic patronage networks. Kyrgyzstan is certainly a showcase in this context. Ruthless factional rivalry among the Kyrgyz ruling elite and regional clans over power and limited financial resources, including foreign assistance provided by the international community, has dramatically affected the country’s 6 million people. As a result of domestic political chaos, nearly 2 million of the country’s population live below the national poverty line; and between 500 thousand and 1 million migrants from Kyrgyzstan are forced to seek jobs outside their homeland. The overwhelming majority of Kyrgyz migrants find seasonal work in Russia and Kazakhstan. Werker presumes that “when foreign aid enters the recipient country, it enters a political system far more complex than the foreign-affairs networks in the donor countries that spawned it.” In other words, international development banks and financial institutions face less clarity from the recipient country, which may abuse the inflow of foreign aid in various shapes and forms. Case in point: Kyrgyz NGOs have complained of difficulties regarding the transparency of foreign aid in certain instances. Foreign aid efficiency in the Kyrgyz Republic has been a topic of discussion throughout the 2000s, and the subject is still contested in the country today. Last month, MP Janar Akayev accused the Kyrgyz Ministry of Education of corruption when it was revealed that the offspring of government officials and parliamentarians were selected through a dubious process to study in Hungary via a foreign assistance program. Ultimately, there are solutions to the challenges of distributing aid in the recipient countries, including effective aid distribution data analysis and time-sensitive monitoring programs to identify and to resolve concerns for elaborate aid policy, as pointed out by scholars and experts. Donors should take careful consideration of these measures when providing aid to Kyrgyzstan in the future.